A horse-drawn carriage has just passed through the Sakashita-mon Gate, while three jinrikisha (rickshaws) are waiting for passengers. In the back the Kunaisho (Imperial Household) building can be seen. The Sakashita-mon was part of the original Edo Castle. First Shogun Tokugawa Ieyasu (1543-1616) made Edo Castle his base in the late 16th century and it remained the Tokugawa residence until 1867. The following year, the emperor moved in and it was was renamed Tokyo Castle (東京城). 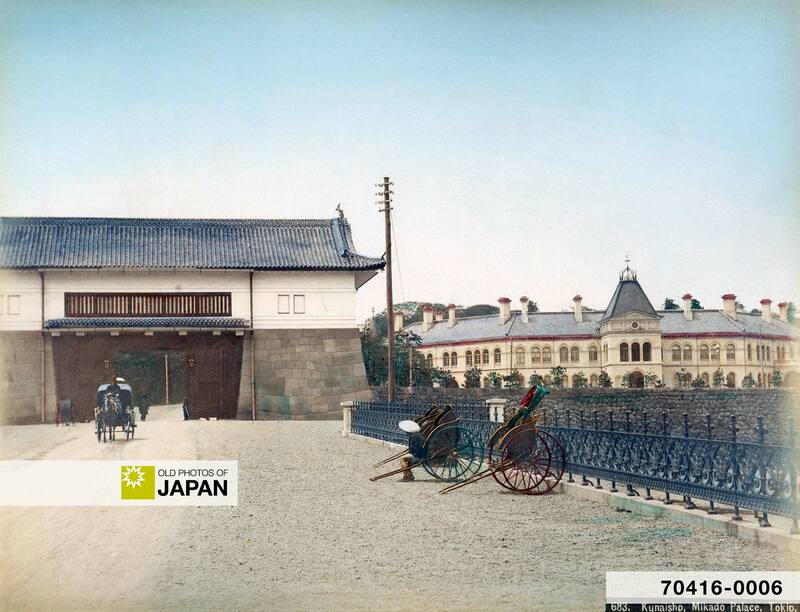 In 1869 (Meiji 3) it was renamed once again and became the Imperial Castle (皇城). Interestingly, the Sakashita-mon originally faced north, but during the Meiji Period (1868-1912) it was changed to face east instead. Almost immediately after Alcock received the disturbing news about the attack on this top government official favorable to friendly relations with foreign nations, a fire broke out at the Foreign Settlement in Yokohama. The British diplomat doesn’t show it in his memoirs, but he must have felt very much under siege. 1 Alcock, Rutherford (1863). The Capital of The Tycoon: A Narrative of a Three Years’ Residence in Japan. Harper & Brothers, Publishers: 336. 3 Imperial Household Agency Visit Guide. You can also licence this image online: 70416-0006 @ MeijiShowa.com.